Hi everyone! This morning I have a small giveaway for my dear readers. 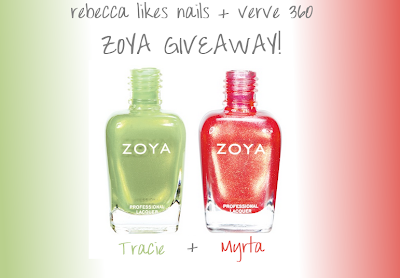 Verve 360 hair salons in Pittsburgh has generously offered to give away two Zoya polishes for my readers! Which beauties are up for grabs? I borrowed some swatch pictures from my friends, let's see them! A soft-but-vibrant green with shimmer, from this summer's Beach Collection! A beautiful coral/orange, super shimmery & perfect for summer, from the Surf Collection! Here are the small rules and instructions for entering this giveaway! You must be a follower of this blog via GFC. You must live in the continental US, or have a shipping address there. The prize will be sent directly to you from Verve 360 and can only be sent within the continental US. Please also leave an email address, so you can be contacted if you win! This giveaway will run for one week - until noon NST on Wednesday, June 20th. A winner will be randomly chosen from the list of comments. Ready, set, go! Thanks again to Verve 360 for sponsoring this prize! My favorite Zoya is Bevin! My favourite Zoya is Kiki, I'm a pink-a-holic!!! Thank you for hosting this giveaway! 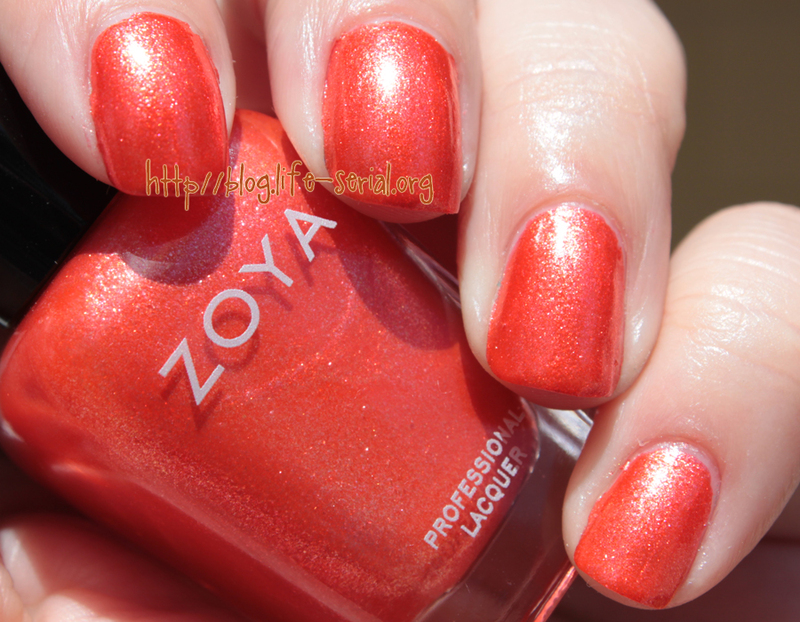 My favorite Zoya is Sooki - fabulous red that can't decide if it wants to be a cream or a jelly. Awesome giveaway! My fav Zoya had to be Kennedy. It goes with everything! My favorite Zoya polish would have to be Jem. My favorite Zoya is Ivanka, I am a green lover! My email is Katiemaeoneill at gmail dot com. I think my favorite Zoya is probably..... Zuza.... it's such a gorgeous color! My fav Zoya is Kotori. I should choose Tasha because it's my nickname out of Natascha but I prefer brighter colors. I think my fave has to be Zuza! I think my favorite is Carrie Ann, it's red and sparkly and I loves it! I would have to say Adina. My favorite Zoya polish is Trixie! My fav is definitely Arizona! i have so many favorites, but from the top of my head, reece! I love Isla!!! It's such a gorgeous deep red!!! my favourite Zoya is Adina. I love it and can't stop staring at my nails every time I wear it! I actually don't own any Zoya nail polishes, so this would be great to win! I have had my eye on Zoya's Indigo though. My favorite Zoya polish is Megan, but I don't have too many in my collection yet! I haven't yet had the pleasure of owning a Zoya polish, but I've had a serious lemming for Zuza and Charla.... By the probably mostly Charla! Hard to choose... Charla I guess?? 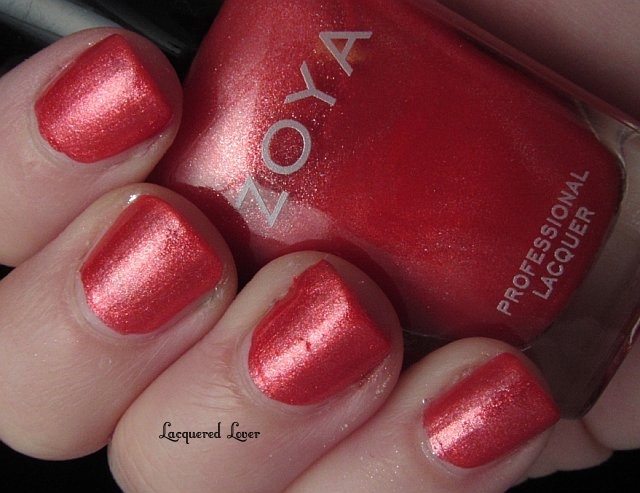 I don't own any Zoya, I don't think they're available where I am :( But I love the Myrta!! Thanks so much for doing this!! I'm in love with Shay! Definitely Nova. Love the sparkle! At the moment my favorite is Zuza! my fav polish from zoya is mimi! I actually have never had the opportunity to try a Zoya polish (shameful I know). Just going by swatches though I'd have to say I love Danii and Charla. I really love Myrta, it's one of my new favorites. I really enjoy Jem; I'm a sucker for purply, duochrome-y colors! My favorite Zoya is definitely Harlow. It's a gorgeous matte that is even more beautiful with a topcoat. So sparkly! Hi! My favorite Zoya is Snowsicle! I layer it over everything! I love Edyta! Thanks for the giveaway! My favorite Zoya polish has to be Bekka. The fluorescent yellow is beautiful with the shimmer, and it doesn't have a green tint like many neon yellows. Thanks for being a super awesome blogger & for this giveaway! My favorite Zoya is easily Gemma! My favorite Zoya color would have to be Freja. I think Faye has to be my favorite! My favorite Zoya is Harley. My favourite is Zoya Zuza from the Surf collection! Thanks for this giveaway! My favorite Zoya is Neeka. I love my Zoya polish! My favorite until now has been Emanuelle, but I just got a box of Zoya with Reagan, Myrta, and Shelby in it, so there may be a change! My favorite Zoya polish is Faye. I love the shots of Tracie. I'm such a sucker for good greens. Sarah is definitely one of my top faves, that red is just magnificent. Charla is my fav but then I'm a sucker for anything teal. My favorite Zoya polish is Yara. Arizona is my current favorite! I dont own any Zoyas yet and I really would love to. But point is I dont know them muich, however from seeing this two, I really love the look of "Tracie" I am loving all the greens that have been coming out lately. my favorite zoya to date is probably Charla or Savita..can't choose! Love too many! My favorite would have to be Perrie but I do love Dannii because it's my nickname! I love Bevin- such a gorgeous and unique color! I ♥ My Followers GIVEAWAY! Born Pretty Color Change Polish! 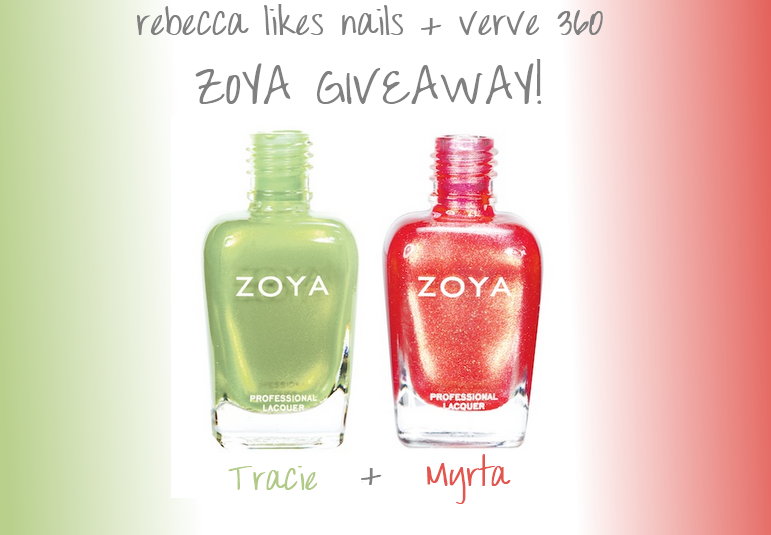 Verve 360 Zoya Giveaway Winner!